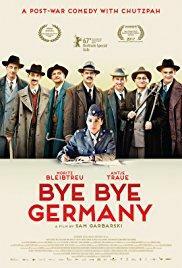 “Bye Bye Germany is a deeply felt, often wry look at a group of Jewish friends — all Nazi-era survivors — who, in 1946 Frankfurt, unite to sell high-end linens to raise the funds to emigrate to America. Not your typical Holocaust-inspired drama. “The antics of these cagey door-to-door peddlers, led by David Bermann, whose family's once-thriving linen store was seized by the Nazis and now stands in ruins, provide a droll spine upon which director Sam Garbarski and his co-writer, novelist Michel Bergmann, build a far more stirring, dimensional story. “This involves David's questioning by attractive American Army investigator, Sara, who suspects that David, whose parents and brothers perished at Auschwitz, may have been a Nazi collaborator.